Japanese film artist from Paris, Yuki Kawamura, who is releasing his first anthology DVD on November in EU, created SHIFT’s cover for this month. His work is invited as the special selection film at “DOTMOV Festival 2005“. He is one of the most spotlighted film artists in today’s industry. Hello, my name is Yuki Kawamura. I was born in Kyoto, Japan, 1979. I’ve moved to France in 2000, and I now live in Paris to make films. Why did you start making films? Well, I used to watch old European town on TV when I was small, and it made me feel sentimental for some reason, although I was only in preschool. ( Laugh) Then, I started having a dream about living in this imaginary town. When I was a teenager, I’ve watched so many French or Italian movies from 50’s and 60’s to find that dream town. I was more engrossed in different director’s different vision. Then I thought, if there was no such town, I should just create my own world with films. That’s how I started making films. How did you start your carrier in Paris? When I was 18, I seriously curious about the dream town, so I took a trip to France, Spain, and Italy. I actually couldn’t find anything like that town I imagined, but when I got to Paris, I felt some strange comfort. It wasn’t exactly my dream town, but it was a good place to make work, and also the country support for making films so I decided to go to a film school in Paris when I was 20. After the graduation, I settled in Paris, and started my carrier in film. What do you think about the creative scene in Paris? What’s the difference between Japan and Paris? The biggest difference is how people spend time for. People are not dependent on information, and able to have their own time in Paris. Also the art is always around the people (young or old), and everybody has their own opinion and talk about those arts. ( Sometimes I feel it’s too long though…) Because of these reasons, it is easier to be and see myself in Paris than in Japan. I think the French creative scene is supported by this people’s energy for the arts. Could you tell me about the DVD which is releasing in November? It is forgoing release only at Centre Pompidou in Paris in November. It will be releasing in Europe, the U.S., Japan, Hong Kong, and Taiwan in mid December. This DVD, titled “SLIDE”, includes 8 films and one bonus film, and is released by “LOWAVE” in France. The title “SLIDE” has my hope that people would be able to slide into a totally new world from another. We make every space with recognition on our eyes and brain. On the other hand, this DVD only has the poetic moments of pictures, which you can only see when you are conscious to see something. All the works on DVD are collaboration with the musician, Yoshihiro Hanno, except the bonus film. I think Mr.Hanno for making such a great music for my films. I got very good influenced by him from working together this time. I would love to work with him again. Could you describe each work on the DVD? 12 red balls spring from the ground into the air. They fall down, come to a stop and fade away　to show the beauty of gravity’s rythm. Outlines of people turn as the people themselves walk into a light space. Everything is connected to each other. Material is transformed as spaces slide into other spaces and people become dust. Running in a snow landscape. Images come and go as memory does. Connected energy of playing children emerges like a fountain dream. 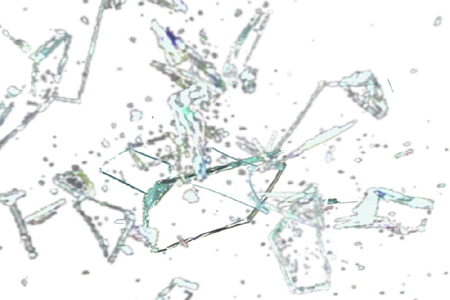 Pieces of glass float almost weightlessly in a void. Due to high fragility they fall apart when they clash. Fragility stands for beauty which is short lasting. People arriving and departing from the airport seen through a revolving door. Modern live as it moves on in time and space. Branches of trees reflect onto the surface of the water. The movement and colors of the images are completely natural and unprocessed. Neighboring objects reveal their intrinsic beauty through the eyes of the viewer. Smoke, clouds and objects appear in the sky. The frame of view travels above to its upmost point demonstrating the infinity of the universe. Two lovers swim in a river called lethe (from Greek mythology: river of forgetfulness). They never meet and thus go apart. A girl dives into the river to forget an unhappy love. Could you tell us about the Shift’s cover this month? I selected and then animated the work from “VOISIN”. “VOISIN” means neighbor in French. I put this title for meeting a neighbor at a park in Paris. What’s your schedule like? And also What would you want to try next? I will participate a Biennial in Santiago, Chile in November, and have an exhibition in Taipei after the new years. Then I have a tour with Yoshihiro Hanno in Europe in mid January. I am also writing scripts and having a shooting for a short film next year. I would like to try to make a feature film in Europe near future. At the end, could you give a massage for the readers? I’ll be glad if you could feel comfort from my films. *DVD “SLIDE” is available at SHIFT FACTORY.